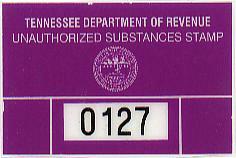 In 2005, the State of Tennessee passed a law requiring persons to pay an excise tax on illegal substances. The Tennessee unauthorized substance tax, or “drug tax” or “crack tax”, applies to controlled substances like marijuana and cocaine, and also illicit alcoholic beverages like moonshine. It allows someone to anonymously purchase stamps in person from the Department of Revenue based on the type and amount of the substance ($3.50 for a gram of marijuana, $50 for a gram of cocaine, etc.) with the understanding that doing so cannot be used against them in a criminal court. Possessing drugs is still illegal – the tax works completely outside the criminal justice system. A stamp cannot provide immunity from criminal prosecution, and a conviction of possession isn’t required for the Department of Revenue to assess the penalties. Opponents to the tax say allowing authorities to levy illegal drugs allows officials to bully people not convicted of crimes into paying thousands of dollars. The opponents of the Tennessee Illegal Substance Tax, and there are many, include a wide variety of groups. In July, 2006, Chancellor Richard Dinkins ruled that the tax was unconstitutional stating that the tax violates an individual’s right against self-incrimination and to due process. Despite this fact, the Tennessee Department of Revenue continues to attempt to collect these taxes. One of the biggest targets for these tax collectors are Bonnaroo concert goers. The money collected at Bonnaroo makes up part of the $3.5 million that Tennessee has raised since its Unauthorized Substance Tax was adopted in 2005. When the Tennessee Department of Revenue taxes an alleged drug possessor, that person has an opportunity to pay the tax. If it is not paid, agents may seize and auction off anything of value the person owns. 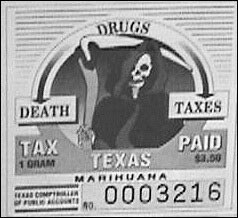 The illegal drug tax, levied per gram, is $3.50 for marijuana, $50 for cocaine, and $200 for meth and crack cocaine. The decision by Chancellor Dinkins in Nashville was appealed by the State of Tennessee and oral arguments were heard in the matter on May 31, 2007. No decision has been issued by the Court of Appeals as of yet, however it does seem likely that the matter will be taken up to the Tennessee Supreme Court no matter who wins at the Court of Appeals. Our office has handled cases by individuals whose property has been levied by the State for the drug tax in the past. Contact us for a free consultation should you have any questions.